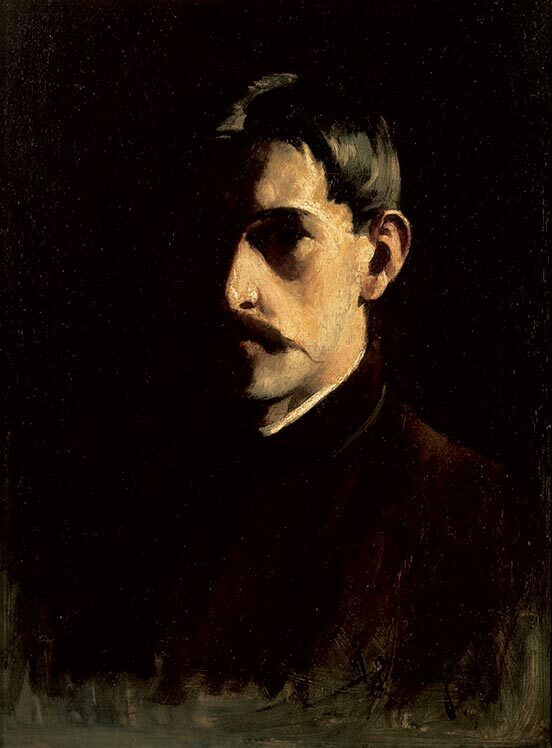 Willard Metcalf, or “Metty” as he was called by his artist friends, found his artistic voice while staying with Miss Florence in Old Lyme. 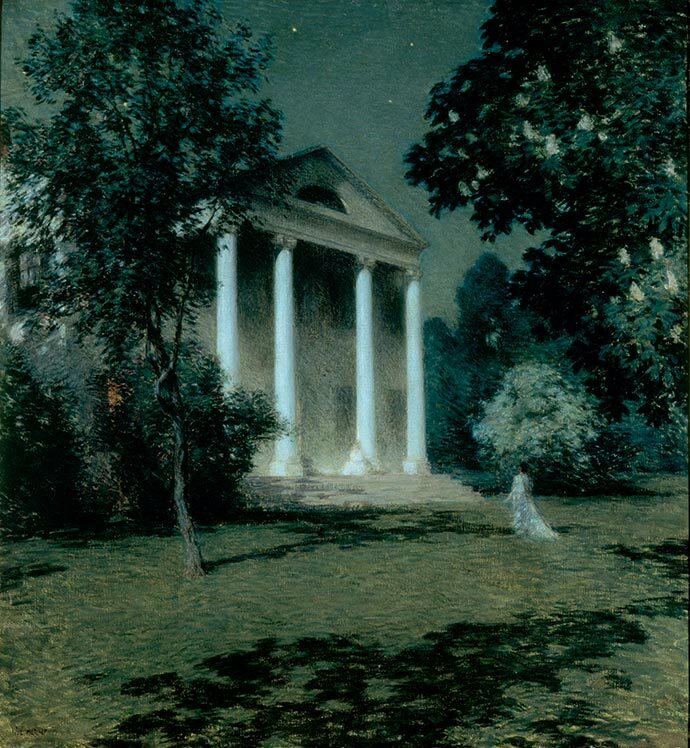 His painting May Night (1906), that shows the front of Miss Florence’s house on a starry spring night, won him prizes and fame when it was exhibited in Washington, D.C. in 1907. He had tried to give the painting to Miss Florence in order to repay some of the debt he had incurred while staying with her. Despite her own money woes, she refused, saying, “I won’t take it, it’s the best thing you’ve ever done. When you show it in New York, they’ll snap it up at once, and everything will be lovely.” (The painting later won the first prize of $1,000 and was the first contemporary painting purchased by The Corcoran Gallery in Washington, D.C.). 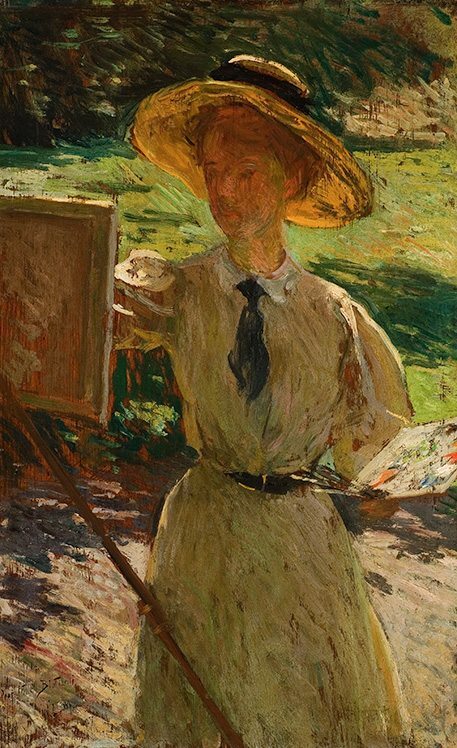 Metcalf followed his New York friend Childe Hassam to Old Lyme as early as 1905 for a summer devoted to painting en plein air, or painting outdoors. For Metcalf, this direct study of nature was part of both his painting technique and his hobby of collecting natural specimens. In 1906, one critic said that Metcalf “connives to translate into paint the freshness and fragrance of fields, gardens and evening air. It is nature, rather than the studio, of which he apprises us.” It was in his paintings of the New England landscape that Metcalf truly excelled, capturing the colors and atmosphere of a crisp fall day and prompting his designation as the Poet Laureate of the New England hills. He was masterful at depicting the seasons when the trees change colors or when winter ice thaws into spring. I hope you are having a pleasant summer and the house is full and all are happy — I can imagine you all sitting out on the steps — or wandering about — enjoying this night’s moonlight. 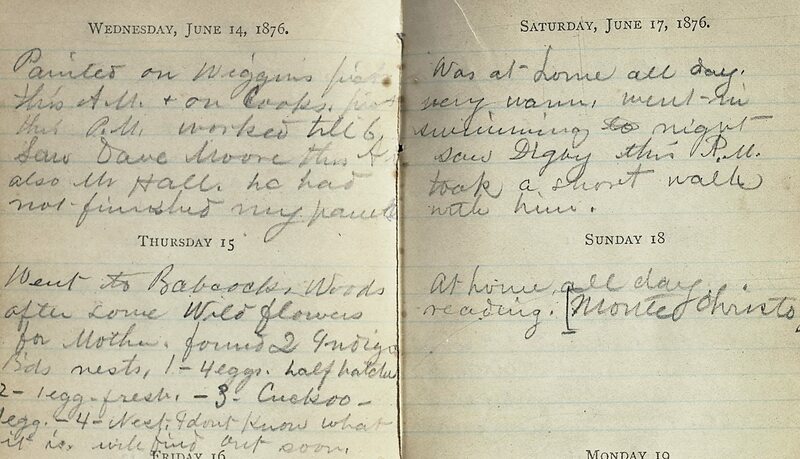 Metcalf was a keen observer of nature as the pages in his many sketchbooks reveal. He is given credit for the idea to line the walls of the Griswold dining room with painted panels. 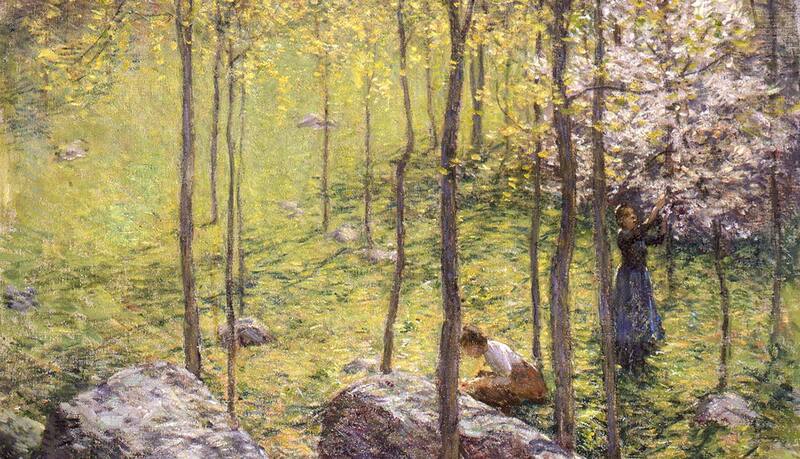 Like Henry Ward Ranger, Metcalf had traveled to Europe before coming to Old Lyme. When in France, he traveled to Giverny (the village where the famous Impressionist Claude Monet lived) and stayed in the Hôtel Baudy, a country inn that catered to artists. This inn was famous for the painted panels in its dining room. During his stay, Metcalf painted In the Café (Au café) in 1888, a busy French café scene on a 14 x 6 inch panel for Gaston and Clarisse Baudy. It remained in the Baudy family until about 1990. Metcalf later shared this idea of painting panels for a dining room with his friends in Old Lyme. Metcalf painted four panels in the dining room. Perhaps it was because he was the one to suggest that the artists add painted panels to the dining room that he led by example. In the one corner of the room he arranged three panels side by side: a seascape, a woodland interior, and a spherical vase of flowers (his only known floral still life!). 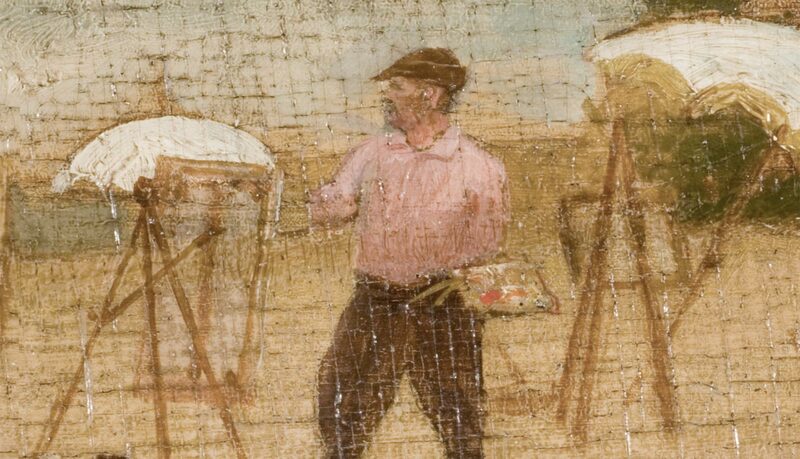 Diagonally across the room he painted his sarcastic ode to female student painters. As a teenager, Metcalf was already fascinated with nature and drawing. 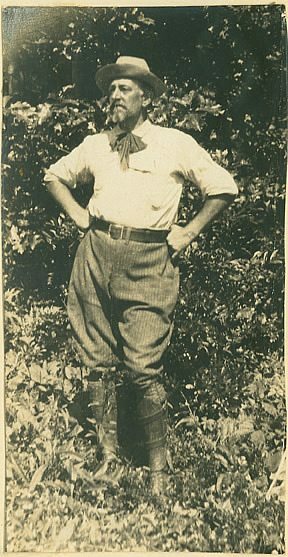 While wandering the woods in search of birds’ eggs and nests, he filled his notebooks with sketches of trees, plants, and landscapes. He even tried pastoral genre scenes. After several years in art school, Metcalf began illustrating for major magazines such as Harper’s Monthly. This practice of working for magazines was common among artists of his generation as a way to make money while working on their art. The prints and drawings in the collection of the Florence Griswold Museum range from personal observations of nature to lovingly rendered portraits of family members in the exceedingly difficult medium of silverpoint. They also include a single wiggle drawing that was most likely created at one of the wiggle game challenges that would help fill the evenings at the Griswold boardinghouse. In 1993 the Museum acquired an extraordinary collection of seven sketchbooks and a diary from 1876 that belonged to Willard Metcalf. 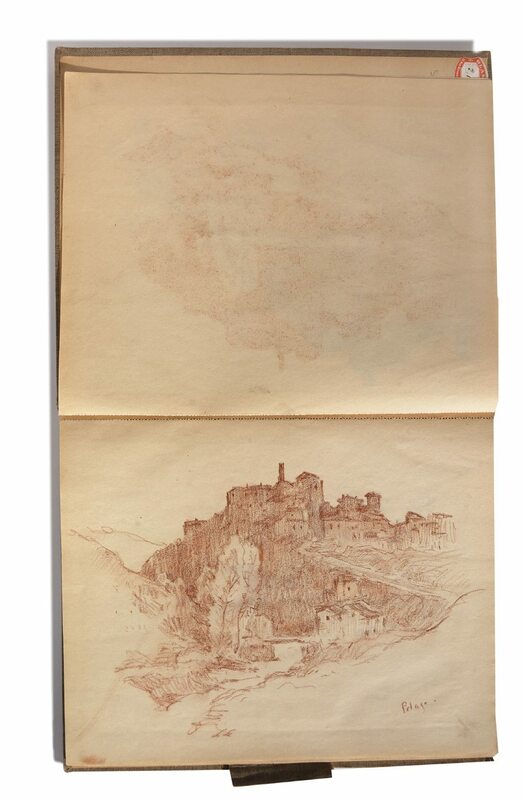 The sketchbooks range from 1875 to 1914, before and after he was involved with the Lyme Art Colony. Three of the sketchbooks are from the early 1880s when Metcalf accompanied the famed Smithsonian ethnologist Frank Hamilton Cushing to New Mexico to prepare illustrations for an article on the Zuni for Harper’s Magazine. The Museum’s collection of Metcalf’s natural materials are contained in a single cabinet that was donated by his wife in 1971. 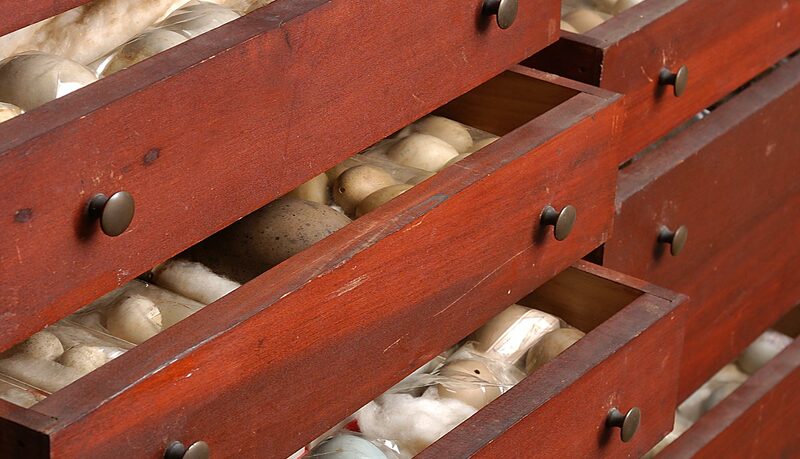 The tall wooden cabinet has 28 drawers, holding birds’ nests and eggs, and 65 butterflies and moths. Some of the earliest specimens are dated from 1885, when the artist was in France. A number of eggs were collected in the village of Giverny, where the Impressionist artist Claude Monet lived and worked. Although the two artists did not become friends, Metcalf did tutor Monet’s son and stepson in botany and ornithology.